First of all, I know my dress looks like a newspaper. It's a hit on school visits, and my parents were journalists. I live in Manhattan but went to high school first in Armonk, New York, then in Rennes, France. I'm a Phi Beta Kappa comp lit graduate of Yale with an M.A. in Spanish from Middlebury. I've been on Today, CNN, Oprah, and The View, and many of my 16 books are in paperback. 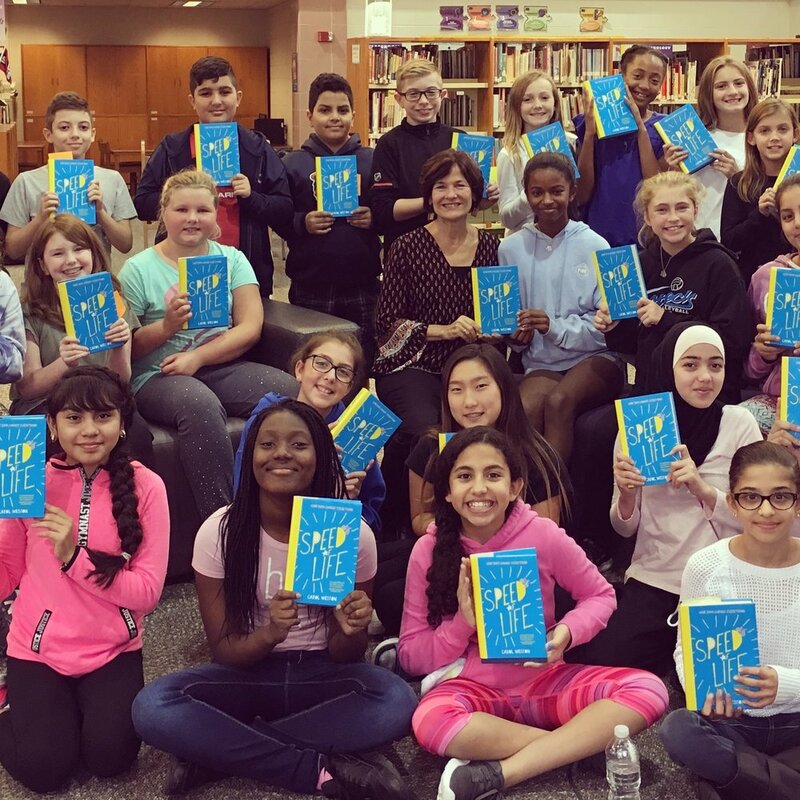 Here's I am at a school in Illinois with SPEED OF LIFE, which got starred reviews in SLJ, PW, Booklist and Kirkus! Newbery Medalist Richard Peck called it a "wonderful book that takes us from love to laughter." What else? I’m big on cats and walking and skiing and art museums. My husband Rob (below) is a playwright and also the property master for the SNL film unit. We have two daughters, Emme and Lizzi. We’re big on Birch Benders Micro-Pancakery. More on Wikipedia.